THE EBOLA VIRUS continues to spread across Liberia. This is the worst outbreak in history! Please PRAY!! 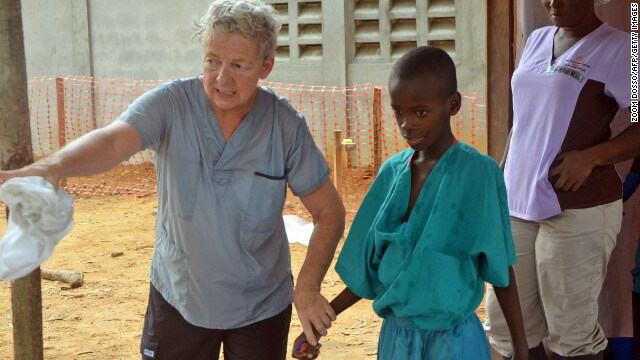 A Canadian Nurse from Samaritan’s Purse walks with a 10 yr. old child who was taken out of quarantine last Thursday. His mother just died from Ebola. This outburst started in Guinea in March. 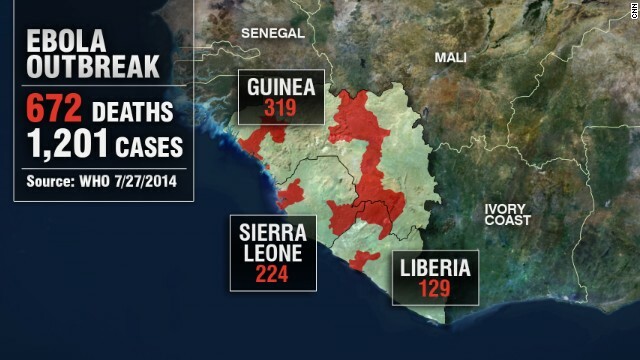 Today it has spread to Sierra Leone and Liberia with 1,201 cases and 672 deaths as this map indicates. This is the deadliest virus known to man with no cure and a mortality rate that is higher than 50% even up to 90% in some outbreaks. This is going viral! Everyone is hoping it will not go global! It’s a time for the world to pray!! Provision of Hope is doing everything possible to protect the Children in our Homes and spread awareness wherever we can. We are buying extra sanitation materials like chlorine, plastic gloves, antibacterial soap, buckets with pumps etc. to take all the precautions we can to avoid any chances of further exposure of this deadly virus. If anyone would like to help us buy sanitation materials or help cover the costs for our “Training and Awareness” Teams to go out to various areas teaching people what they can do to protect themselves from this virus, it would be most appreciated. They need help!! President Ellen Johnson Sirleaf closed most of it’s borders on Monday to try to halt the spread of the Ebola Virus. “Preventive and testing centres will be established at the five entry points for all outgoing and incoming travellers’’ the president announced. Johnson -Sirleaf also announced restrictions on public gatherings and requested hotels, restaurants, entertainment centres and video clubs, to show educational Ebola prevention videos. According to the president, Liberia is planning to install facilities to wash hands in government facilities and public places across the country. Provision of Hope too is promoting these hand washing facilities making it very practical in our spheres of influence, homes and communities. “Communities seriously affected by the Ebola outbreak will be quarantined,’’ President Ellen stressed. Our Liberian families are very concerned! Pray for Dr. Kent Brantly with Samaritan’s Purse and Nancy Writebol hygienist with SIM, who both contracted the virus while working with Ebola patients in Liberia. Health Care Workers are at highest risk, working directly with the virus. Here are more links on this deadly virus. We are praying for this TO END! Pray too for those in Liberia who do not believe that Ebola is real. Some are fighting the groups who are trying to help to contain this deadly virus. Some are saying that the doctors are killing these patients. There is panic everywhere! Health experts are saying that if the virus is detected early, there is HOPE. Contracting this virus is not a death sentence! However we need a cure for this life threatening virus. PLEASE JOIN US IN PRAYING FOR OUR FRIENDS AND FAMILIES IN GUINEA, SIERRA LEONE AND LIBERIA AND THAT THE MEDICAL EXPERTS WOULD FIND A CURE FOR THIS DEADLY VIRUS. GOD, WE ARE ASKING FOR HELP! Always our thoughts are with the persons who suffer, the innocent who have to be so strong and the prayers always keep coming from our souls. Jah Ras Tafari, Creator of Everything, create the miracle to stop the suffering and GOD BLESS US ALL. I have sent a cheque to POH for $100. I know this is a drop in the bucket but God can use it in miraculous ways. We will pray for the sick, families, the help, the nation. Once again we are made aware of how blessed we are in North America with our health care.